The decision by Tata Steel Ltd(TSL) to shutter its loss-making UK-based Teesside Cast Products (TCP) facility will be viewed with relief by investors. The steel slab-making facility ate away two-thirds of TSL’s consolidated Ebidta (earnings before interest, depreciation, tax and amortization) of $254 million (Rs1,176 crore) in the September quarter. The TCP facility was dependent on long-term buyers to buy its 3 million tonne output of merchant steel slabs and its key customers, who had contracted to buy 78% of its output, had stopped buying from the plant. The closure will lower TSEL’s cash burn and improve profitability. Its effect will be partly visible in the fourth quarter and become more prominent in early fiscal 2011. There will be additional restructuring charges affecting its net profit, however. The thing about restructuring is that investors will be satisfied only when the benefits trickle down to the earnings per share (EPS) level. Companies initially invest in these programmes, making severance payments to workers or incurring losses in scrapping assets and other related costs, but the benefits come with a lag. In the short to medium term, TSEL’s ongoing restructuring will affect its net profit growth. 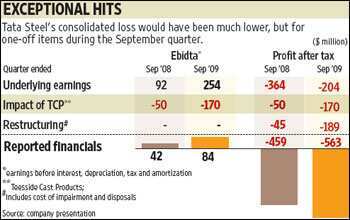 A sustained improvement at the Ebitda level will be a signal that the restructuring is successful. In the second half, TSEL’s capacity utilization is expected to be higher, steel prices are expected to be stable and input costs are easing. All this should contribute to better operating results. On Friday, Tata Steels’s share price was up by around 6% from a week earlier, when its consolidated results were announced, but down by 1.3% over its previous close. The TCP closure announcement came after market hours, so Monday may see some positive sentiment creeping in.